In a setting ringed by live oaks and caressed by cool ocean breezes, the Ocean Club Villas were designed with luxury in mind. Nestled inside the gated community of Wild Dunes, the Ocean Club Villas have their own private gated entrance along with 24-hour security. The Ocean Club Villas are an impressive, 102-unit, five-story complex sited to take full advantage of the spectacular Atlantic Ocean views. 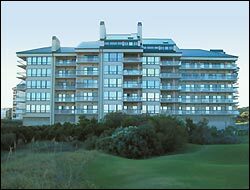 The two buildings frame the 18th green and fairway of the Wild Dunes Links golf course. 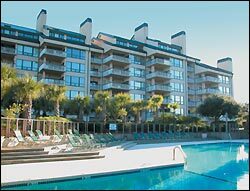 Each condominium has an ocean view, with the upper units also enjoying marvelous views of the Intracoastal Waterway and Dewees Island. Composed entirely of three- and four-bedroom units, the Ocean Club Villas offer both superb yearround living and the perfect low-maintenance second home. While long-term and short-term rentals are permitted, most units are owner-occupied. Each unit features under-building designated parking and elevators, and the entire community is within walking distance of the Links Course clubhouse. Residents can take full advantage of the on-site pool and natural walking trails. A Jacuzzi with spectacular ocean views is secluded among the magnificent live oaks. 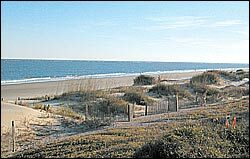 Beachfront access is easy from the two private boardwalks. The Ocean Club Villas offer a variety of floor plans. The four-bedroom units have dual master suites and a second level with either an open deck or dormer skylights in addition to an oceanfront balcony. Wraparound balconies connect the living room to the master suite and make the most of the dramatic ocean views. Each unit has a wood-burning fireplace and marble baths with dual-head showers. These spacious homes range from 1,900 to 2,800 square feet.